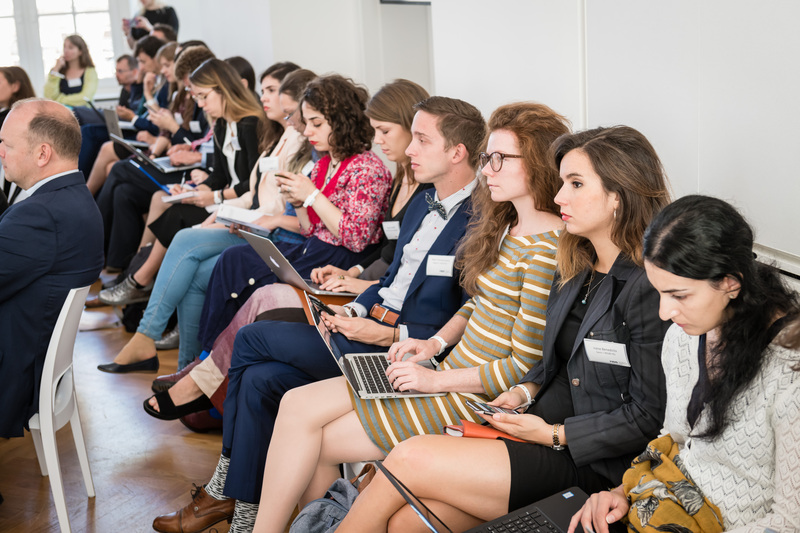 The M100 Young European Journalists Workshop 2018 (M100YEJ) is the 14th of its kind. 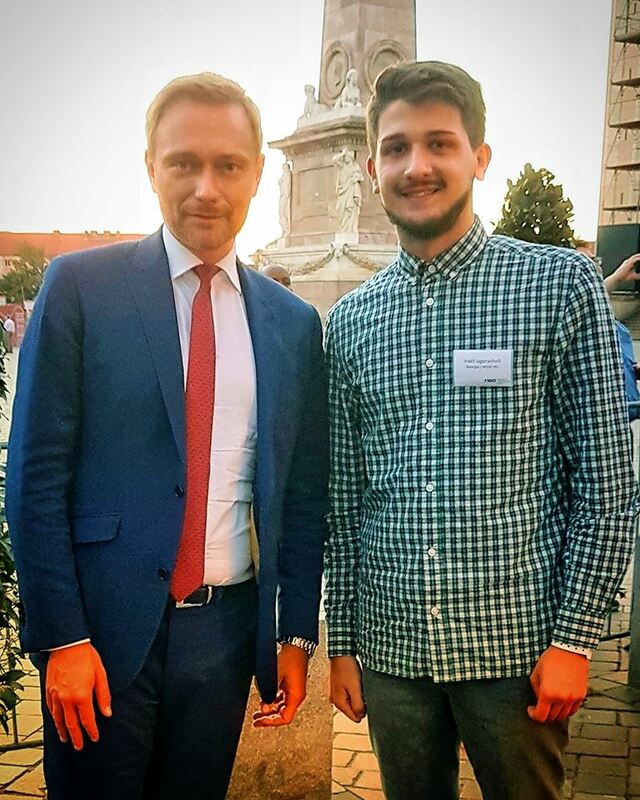 More than 70 highly qualified young journalists from Europe, the Eastern Partnership countries (Armenia, Azerbaijan, Belarus, Georgia, Moldova, and Ukraine) and Russia have applied. 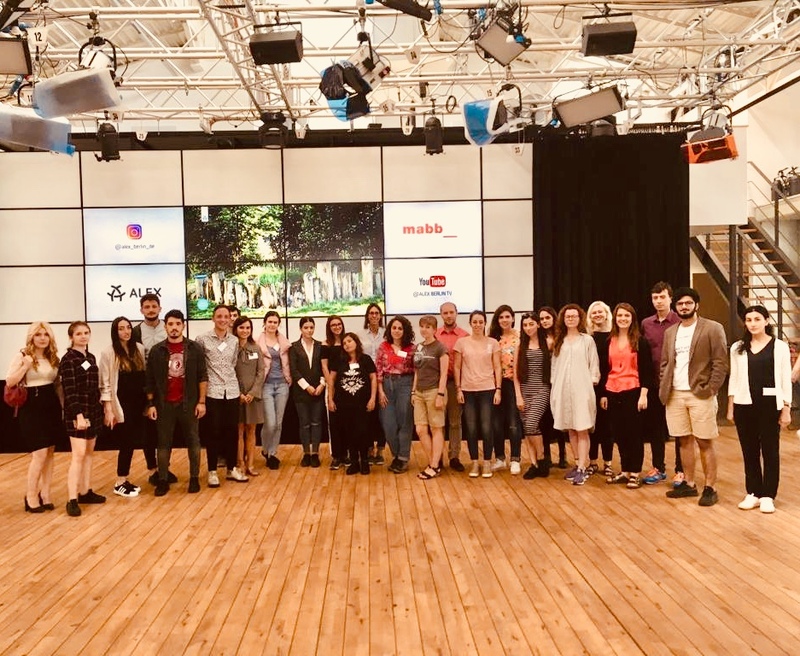 The 25 selected young journalists were invited to a diverse programme on “Journalism and Political Education in the Social Web“ from September 10 to 18, 2018. Our journalists from post-Soviet countries were motivated above all by the great opportunity of social media in their home countries. The few independent journalists or journalistic media in the countries of the Eastern Partnership and Russia are under strong political and economic pressure. Only social media offer them space for independent journalism and a free formation of opinions far from one-sided media reporting close to the government. At the same time, they allow the free formation and organization of political groups. The first aim of the workshop was, therefore, to strengthen freedom of the press in the home countries of the young journalists: Workshops on mobile reporting or the verification of social media content were to facilitate journalism and reporting using simple and cost-effective means. The majority of the European M100YEJ participants were more concerned about the dangers of social media. They feared the spread of fake news and propaganda and a one-sided absorption of information through algorithms, whereby right-wing populist and anti-democratic movements could continue to receive support. Hence, the second goal of the workshop was to teach the participants how to deal with fake news and hate speech and sensitize them to the dangers of social media. 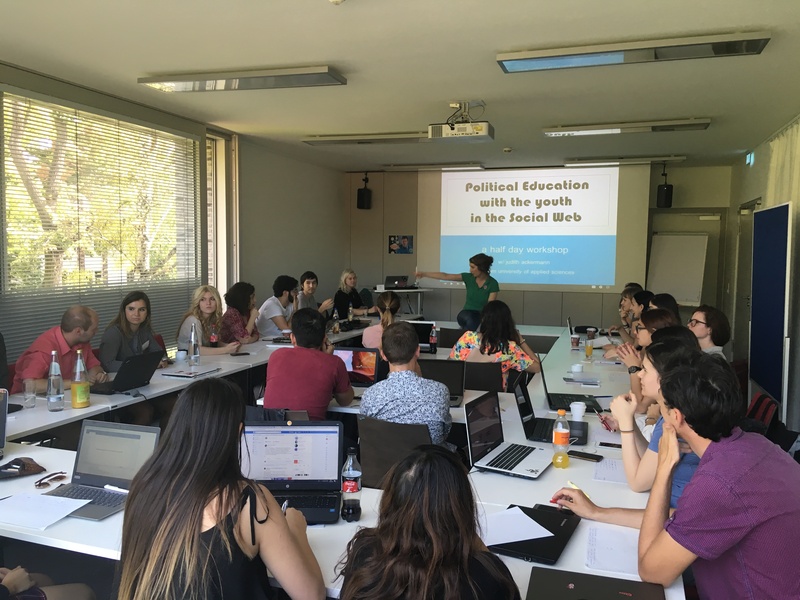 The Workshop was set at the intersection of web video, social networks, and political education work with the goal of promoting projects of political education work. 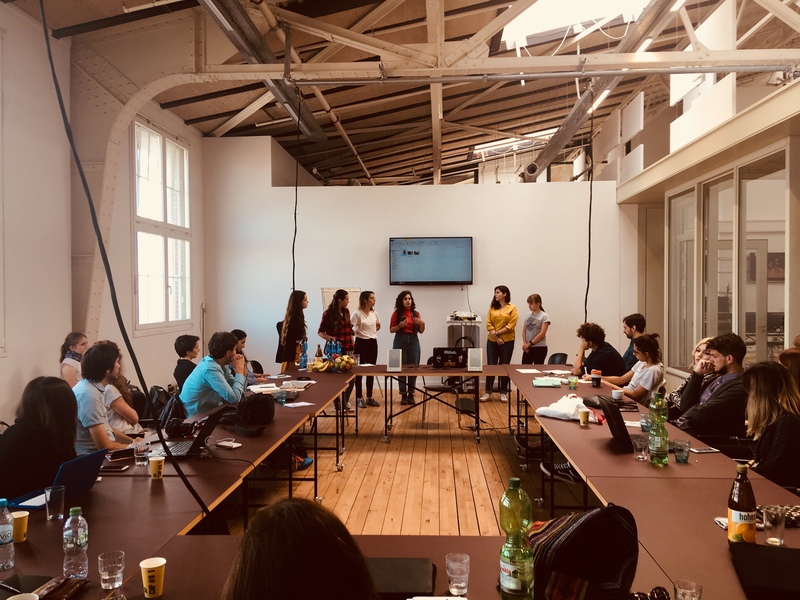 At the end of the 6-day training, the participants’ own projects on the topics of environment, migration, fake news, identity and EU elections were presented at a pitch at the cross-media community channel Alex Berlin. The best web videos will soon be published online by Alex Berlin. The workshop also enabled an international and interdisciplinary network of the participants. The workshop ended with the participation in the M100 Sanssouci Colloquium “Home Alone? Europe and the Post-American Age” on September 18, 2018. The international media conference invited over 60 international editors-in-chief, historians and representatives of political organizations to Potsdam to discuss the new transatlantic relationship, Europe’s agenda for the post-American era and the role of the media. The M100YEJ was funded by the Federal Foreign Office and the National Endowment for Democracy (NED). Cooperation partners were ALEX Berlin, European Youth Press, Chai Khana, Press Club Belarus, Media Innovation Center Babelsberg (MIZ), Orange Magazine and Telefonica. On their day of arrival in Berlin on Monday the young journalists were welcomed by the M100 team on a joint dinner in a restaurant where they met their fellow journalists for the first time in person. Before, they have already met in a closed Facebook group to get in touch with each other, share experiences and ideas and ask questions. 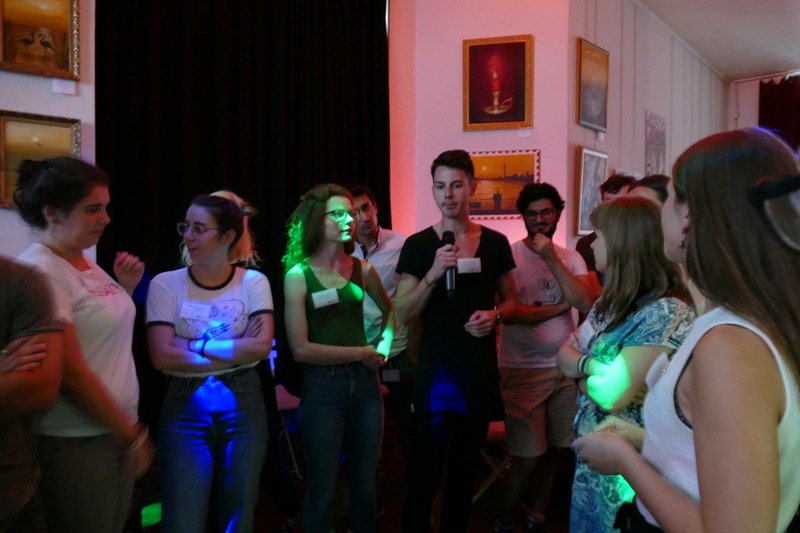 In the beginning, the journalists were introduced to the schedule of the workshop and to the cooperation partners Orange Magazine, European Youth Press and ALEX Berlin. Since the participants have not been acquainted with each other, the following interactive games helped the young journalists start thinking about their group projects, identify similar fields of interest and get to know each other. They shortly presented their home countries, formed groups and discussed potential project topics. A panel with Eva Schulz, Louis Klamroth und Firas Alshater on the topic of the M100YEJ and a Q & A followed. All panelists have different experiences with the usage of the social web. Eva Schulz is a journalist and presenter of the Facebook page “Deutschland 3000” which publishes web videos on political issues from the perspective of millennials. Hence, she had relevant recommendations for the young journalists on how to impart political education content to the youth with the format web video. Firas Alshater is a YouTuber for his own channel “Zukar” and the series “Firas under Menschen” for Deutsche Welle. As a more traditional YouTuber, he had many recommendations on successful storytelling and on how to deal with hate speech in the social web. Louis Klamroth presented another approach on how to reach people in the social web. 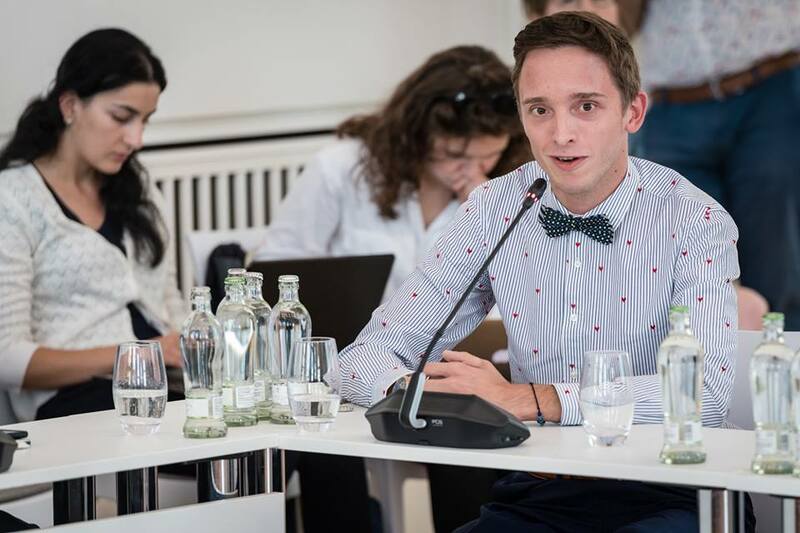 He co-founded the discussion platform “Diskutier mit mir” which matches people with different political attitudes and makes them discuss on various topics in chats. Following the panel and the Q & A discussion, the dinner was opened and all participants could also get in touch with the three experts in individual conversations and ask them questions. 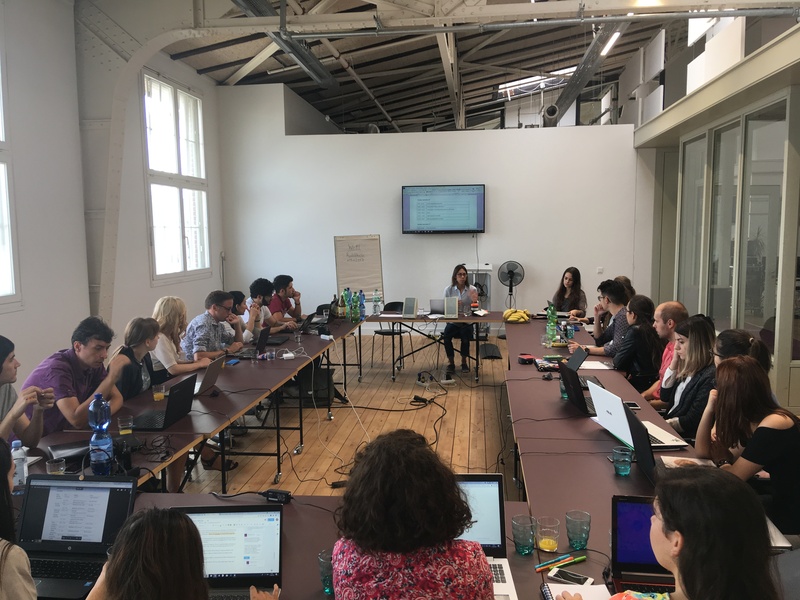 On the first workshop day, Julia Brötz who is the editor of “Deutschland 3000” with Eva Schulz and the project manager of the traineeship programme of ALEX Berlin introduced to the German media system and presented ALEX Berlin as an “Open Access” and “Crossmedial Community Channel”. ALEX Berlin is part of the public broadcasting system which was brought to Germany by the Allied forces and is therefore modeled after the BBC. As it is a system that is funded by people, it is not for profit and independent of any funding and interest by the state or other organization. To have access to public broadcasting channels, every household needs to pay every month, regardless of the extent of its consumption. In the mid-80s, the German Public Broadcasting system became open for the private market due to the westernization of Germany and the modernization of media production. As a result, so-called „Open Access Channels“ like ALEX Berlin were formed to supplement the broadcasting landscape of public and private broadcasting with the third pillar of media diversity. Such channels provide the necessary infrastructure, production technology, premises and appropriate educational offers to all citizens in the local broadcasting area, usually free of charge or for a small fee or expense. In the case of ALEX, the content is mostly in German and is addressed to the audience in Berlin and Brandenburg. At the same time, ALEX Berlin calls itself a „Crossmedial Community Channel“, as it covers a lot of different organizations, stations, and channels on TV, Radio, and Online and invites people especially from Brandenburg and Berlin to learn how to produce own high-quality television or radio content. 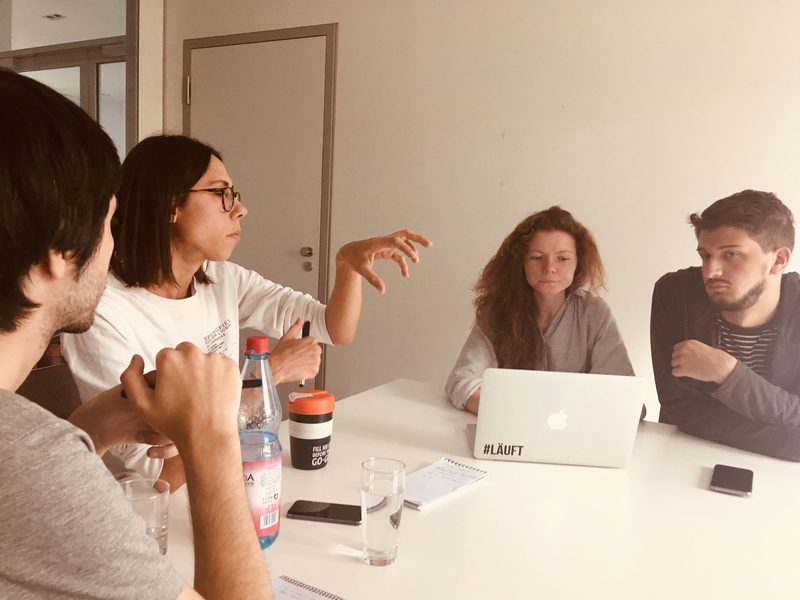 Following a tour in the building of ALEX, Vanda Hehr and Marie Fastabend who are both responsible for the social media of ALEX gave concrete guidelines for the projects that the YEJ participants worked on during the M100YEJ. The guidelines informed the young journalists about the requirements their projects have to meet for their publication and prepared them for the pitch at ALEX in the end. For example, the length of web videos and hashtags differ for different social media channels. Moreover, the choice of the social media channels has been discussed, because different content works better on different channels: Political content is more successful on Twitter and Facebook, Instagram is more personal and YouTube is the platform for the longest contributions. 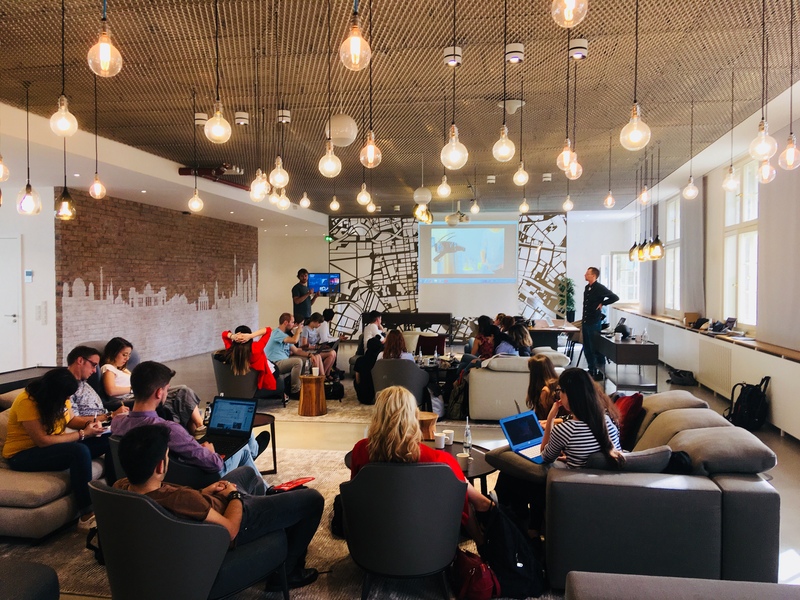 In the afternoon the participants received an introduction to the topic of the M100YEJ by the Professor of Digital Media in Social Work, Judith Ackermann. The workshop started with a quick game “something real, something fake” to get to know each other, but also to sensitize all the participants for the reasons why people tend to consider certain information rather fake or true. A discussion on the role of social media for the youth and why political education can be successfully transported in the social web followed. Judith Ackermann illustrated the relevance of social media showing different statistics. The “Youth Information Study in Germany” revealed that nearly 100 % own smartphones, 97% use internet, 97% smartphone and 86% use online video. Most prominent internet activities are YouTube, WhatsApp, Instagram, and Snapchat. The use of Facebook and Google is comparatively low. The study did not only show that YouTube is consumed mostly, but also in what way. Of course, traditional YouTube consumption behavior prevails, because the platform is mainly used to watch music videos. However, it also showed that young Germans are also very much interested in videos by YouTubers, explanatory videos on school topics or tutorials. Judith explained the reasons for these developments. People mostly consume video blogs for their identity development or parasocial interaction, followed by entertainment and boredom. YouTubers and instagramers can trace their success to humor (30,5%), content/topic (24,2%), character (20%), authenticity (12,6 %), style (6,3%)or skills (3,2%). The next agenda item dealt with potentials and challenges of the social web for political education work. As for the challenges, hate speech has intensively been discussed. Thanks to the different cultural backgrounds of the YEJ participants, the debate was quite diverse and different experiences in different countries on the topic have been shared. Judith’s recommendation for successful web videos: „It is all about being real, about interaction and about matching.“ She showed examples of how to successfully reach the youth by integrating the viewer and calling them to action. Finally, Judith supported the young journalists to find topics and match them to form groups. As a result, five groups were matched that all agreed on one topic: Migration, Ecology, Fake News, EU elections and Identity. Now the YEJ participants can start developing ideas for the pitch at ALEX Berlin. As the participants have already formed groups, found project topics and received an introduction to the topic of the #M100YEJ on the previous day, the workshop finally turned very practical: The filmmakers Christoph Heymann & Jannis Keil taught our young journalists mobile reporting, so they could produce own web videos using simple and cost-effective means. They presented different apps, such as KineMaster, Legend, Adobe Clip, ActionMovie, and FxGuru that are all accessible for free. 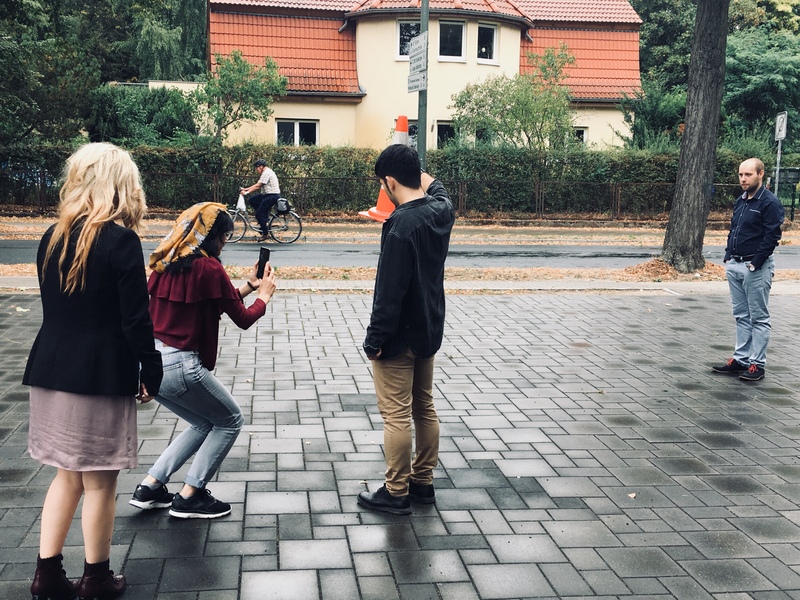 As the workshop was very practical, the young journalists received many tasks and started shooting different videos using the Apps in Berlin. The results have been showed and analyzed at the end of the day with the two workshop trainers. On the second day of the workshop on mobile reporting, Christoph and Jannis focused more on teaching the participants to work with different perspectives in videos. 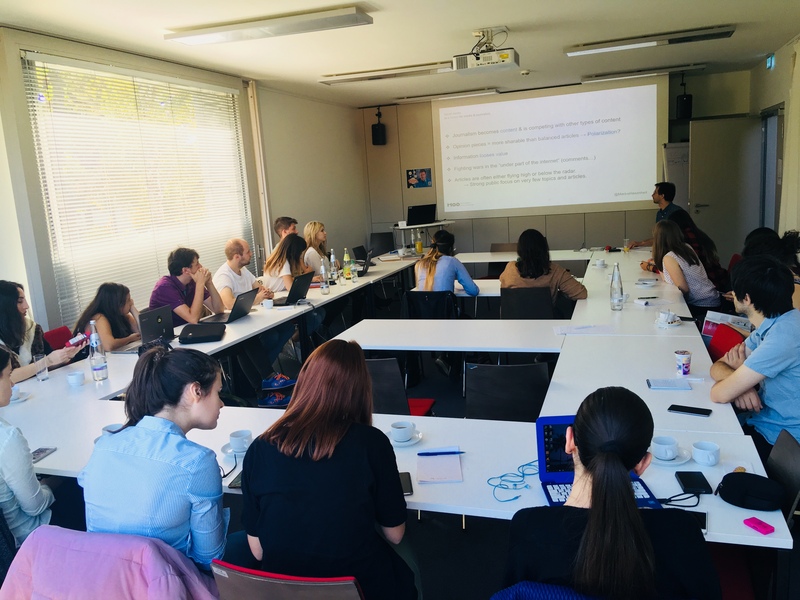 In the afternoon, the head of client projects of our cooperation partner Sourcefabric, Gideon Lehmann explained the Live Blog, a tool that the participants were responsible to cover the M100 Sanssouci Colloquium. The Liveblog have been shown on the screens at the conference in order to make the discussion more visible and facilitate reporting afterward. After the introduction, the young journalists had free time to work on their web videos for the pitch on Friday at ALEX. As they should be free to choose the shooting place, everybody could go to the preferred places and were not obliged to stay in the MIZ Babelsberg where the morning workshop took place. Storytelling was the keyword for the 25 young journalists on the fifth day of the workshop, which took place in the Telefonica in Berlin. How does a story have to be structured in order to attract attention and then convey targeted information? This was the key question that Robert Ackermann, a Video reporter for funk, discussed with the participants. Talking about Do’s and Don’ts of journalism and political education in the social web, several examples have been discussed. Moreover, different groups showed web video examples from their home countries. The opinions on the shown examples were quite divided. Opinions varied, for example, depending on the different cultural backgrounds. An older woman glides over the water in her boat, standing in front, holding the paddle and singing. She probably does what she always does. Right next to her – in the 360-degree video she shows – information about her everyday life in the Ukrainian wasteland is shown. Oleksandr Yaroshchuk, a young Ukrainian journalist, had chosen the video from the online medium Ukrainer.net as an example for the discussion. Can the poor infrastructure in rural regions of Ukraine be brought to attention in this way? It would be more impressive and direct if the woman herself told us about her life, Kirill Filimonov said. 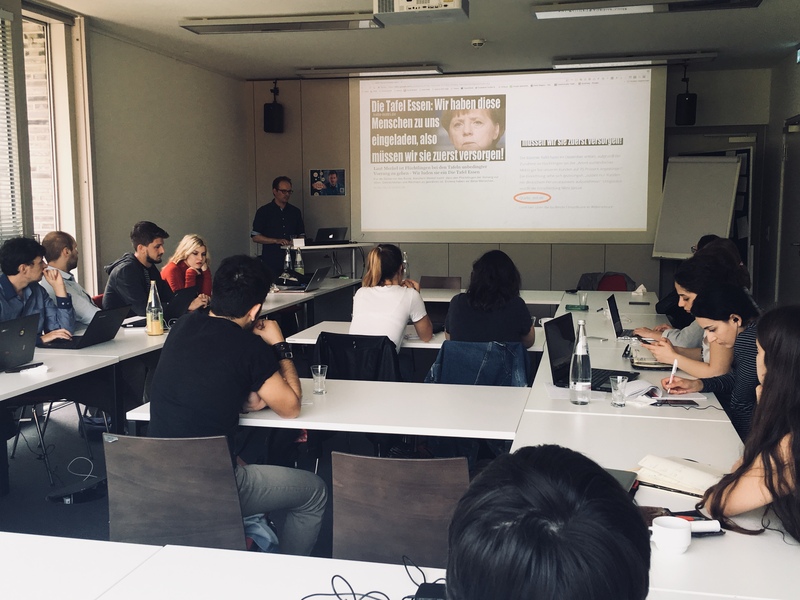 As the YEJ participants have already learned the technical skills and storytelling, the workshop by Marius Hasenheit was focusing on social campaigning in order to teach them how to reach their target groups and why social campaigning is relevant for journalism. The first advice of Marius for the young journalists was not to rely only on one social media platform. As trends are changing very quickly, people also change network platforms. However, it is important to know the differences of platforms: “Facebook is for the people, you used to know, LinkedIn for people you wouldn`t know without your job, Instagram for people you know and Twitter for the people you would like to know“. We jointly discussed developments in journalism through social media: More opinion pieces circulate because they are more “shareable” and users want to show what they are thinking about certain content. At the same time, this can also lead to increasing polarization of societies. Collaborative journalism has been facilitated, as users are more integrated into an investigation, journalists are connected more easily. Moreover, journalism has become cheaper, because information loses value and journalism is competing with many other types of content. Finally, personification has increased and journalists present themselves as “brand”, as people tend to be more interested in people. Marius also demonstrated the shift in the attitude towards the social media: In 2010, people tend to be very optimistic, because they considered it as a means for democratization, more access to sources for journalists and more ways to validate information. However, in 2016, people get disillusioned because of developments like fake news. 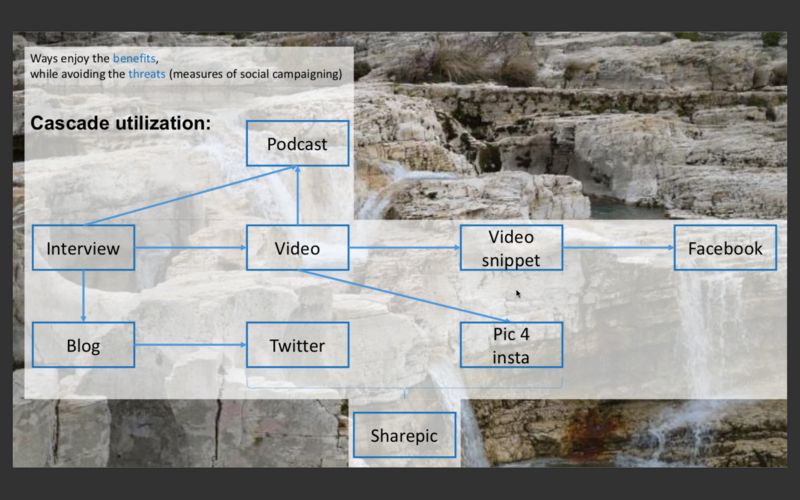 As for social campaigning, Marius suggested a multi-channel approach. Of course, it is important to use different platforms but at the same time to be creative of how to reach people. Events, exhibitions or newsletters can help. Moreover, it is important to effectively spread content on different platforms. After Marius’ workshop, the young journalists had again free time to work on their web videos for the pitch on Friday at ALEX. On the day before the Pitch at ALEX Berlin, Julia Brötz gave editorial support to all the five different groups in the morning. She was especially concerned about developing a thesis and asked for the story of each project in one sentence with a clear message. More questions followed: Who is the video for? Who would like this, share this, comment on this? How do you want to interact with them? On which platform can you reach your audience best? What are the rules of that platform and how can you use them to your best advantage? What is the one piece of information your audience should care about? How can you convey this message in the most eye-catching way? How will you continue to tell the story after your video is published? The questions helped the young journalists realize what is important to consider when it comes to the production of web videos. Julia gave feedback and the YEJ participants finalize their projects. Afterward, the last workshop on the verification of social media content with Fiete Stegers started. The main goal was to teach the young journalists in checking sources and debunking false information. Fiete Stegers started with some case examples of false information: After the attack in Münster (Germany) in April 2018, for example, photos or names of suspects circulated in the media, but were actually fake. He also informed about different types of misinformation and disinformation, such as fabricated, manipulated, misleading or imposter content or satire, false context or connection. He called for always applying journalistic standards in the social media. However, regular users do not always refer to reliable sources and because of phenomena like social bots, fake content gets more successful and seems trustworthy to many people. Therefore, the young journalists learned how to identify such fake accounts, by investigating the username, contact details, followers, the status of activity, ways to connect or comments on posts. In order to check photos, the YEJ participants learned how to use Reverse Image Search“, “Jeffrey’s Image Metadate Viewer” and many other websites where you can receive information about the shooting location, time and other. Geolocation was another agenda item: We learned the indicators to identify the location of a photo and checked the place on google maps afterward in order to verify the picture. Alternatives for maps, satellite images, and panorama views: Yandex, Bing, Open Street Map, Wikimapia, Mapillary. Finally, Fiete Stegers started a quiz, so everybody could directly apply what they have learned during the workshop. Images were shown and the group who managed to find out the time and location of the photo or identified misinformation or fake accounts won a point. Moreover, Fiete Stegers quickly introduced another toolset to identify fake news and misinformation that have not been discussed yet, because time was limited. A website, for instance, helps to count the number of people that are able to fit a place in the world in order for journalists to prove articles and information on demonstrations. Another website helps find twitter posts that have been already deleted. 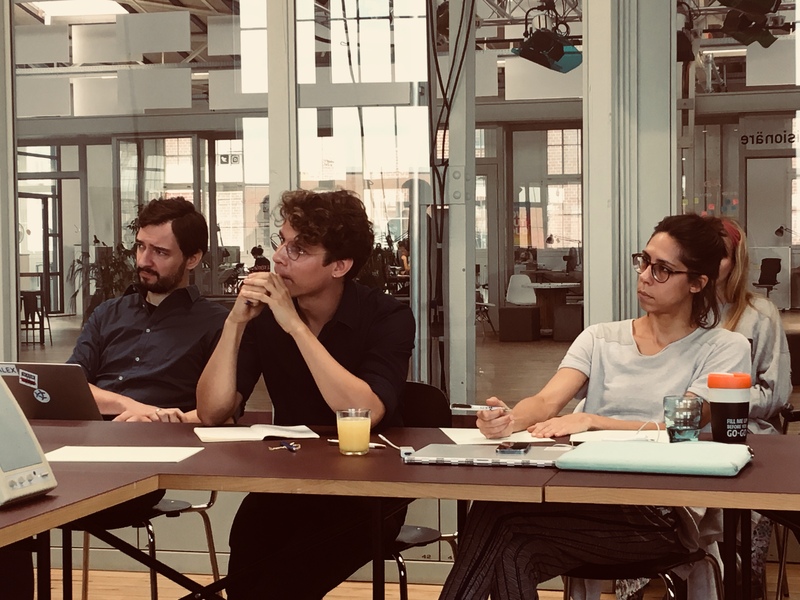 The results of the M100YEJ have been pitched at ALEX Berlin to a jury with the ALEX team and the influencer Florian Prokop. After a short time for the preparation of the presentation, every group started to introduce its project by explaining the topic, goal, target group and strategy of social campaigning. Afterward, each web video has been shown and questions have been raised. After a lunch break, the jury gave concrete feedback to each project and at the same time showed best practice examples. All the projects could have been published at ALEX, because topics and ideas were strong and interesting to the Berlin audience. However, due to limited time, only two projects have been accomplished. The other groups could only present pilot web videos and only present their concepts. However, all of them were eager to keep in touch with each other and ALEX in order to continue to work on their videos and publish them later. 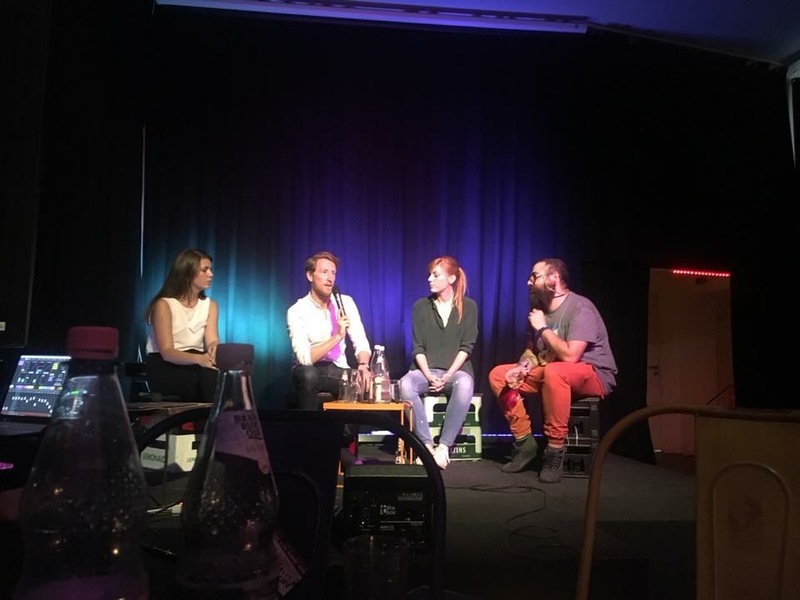 As for the EU elections project, Julia Brötz also suggested collaborating with Eva Schulz and Deutschland 3000, as the young journalists could contribute conducting interviews with people from the respective home countries that Deutschland 3000 could never manage to reach. The “water-sustainability” and the “identity” project has been published by ALEX and can be found on the ALEX & M100 Instagram, Twitter, Facebook, and YouTube Channel. 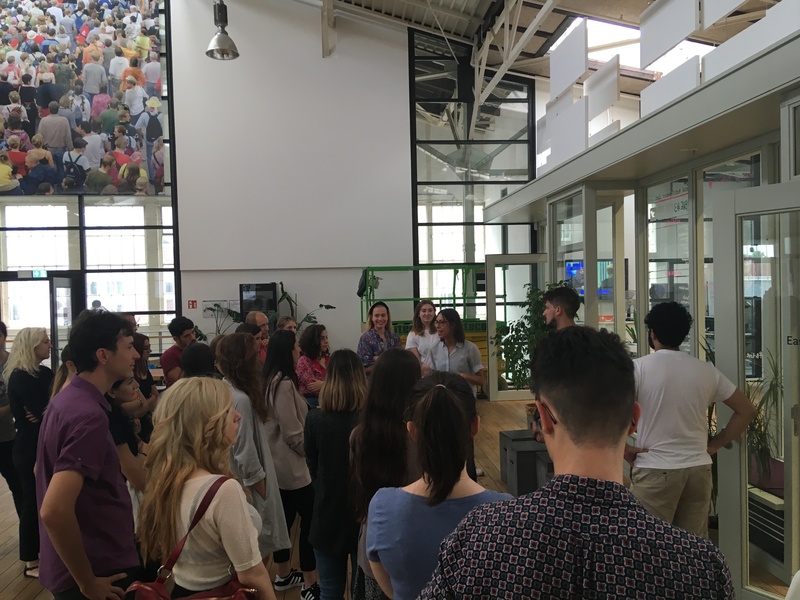 Following, the YEJ participants were invited to visit the start-up StoryMachine of the former editor-in-chief and publisher of the German boulevard newspaper BILD, Kai Diekmann. 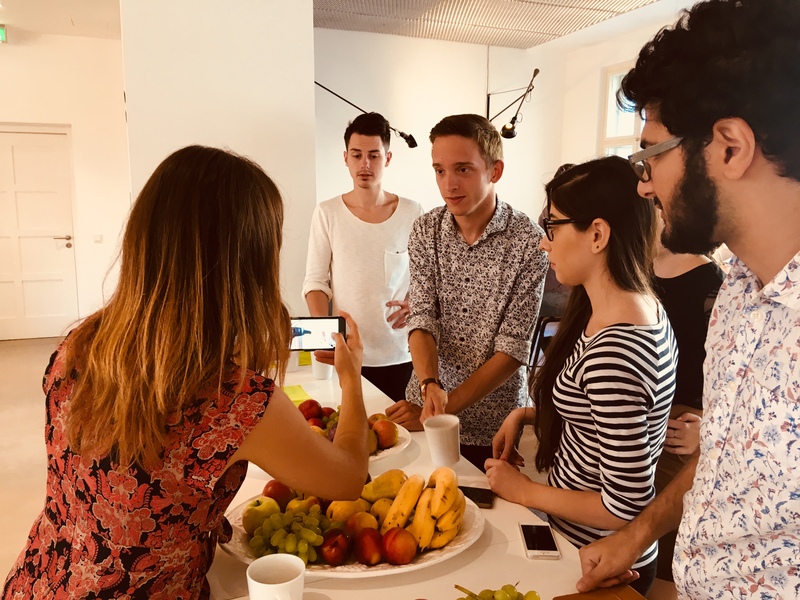 Kai and his colleague Max Zender introduced to their start-up, explaining its concept and giving special insights that the StoryMachine team is usually not open about in the public. StoryMachine is an agency that wants to offer editorial services related to the Internet and social media platforms to companies. 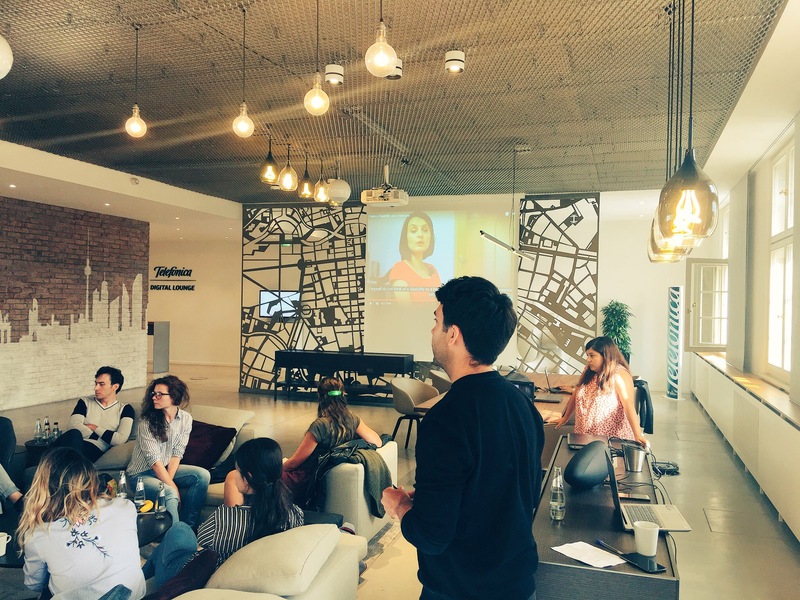 A debate on Traditional and New Media followed and whether StoryMachine is rather a PR agency. As there is a general shift in the culture of reporting, because debates worldwide are increasingly being held on Social Media, Kai emphasized that he considers himself still a journalist. It was also very interesting for the young journalists to see the office of StoryMachine. The trip was a great opportunity for the young journalists to also get to know an alternative business idea working with social media. “Home Alone? – Europe and the Post-American Age” was the headline under which some 60 editors-in-chief, historians and politicians from Europe and the USA discussed the state of transatlantic relations, the European agenda in the Post-American era and the role of the media at the M100 Sanssouci Colloquium in the Barberini Museum during the day. The young journalists have been responsible for the live blog during the day that could be seen on the M100 website and on the screens next to the round-table of the conference. 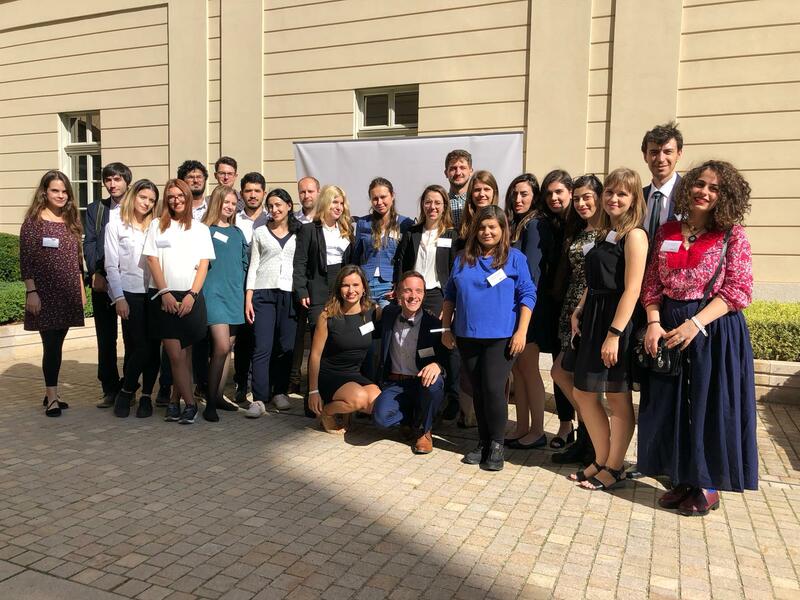 The participation of the young journalists in the international media conference M100 Sanssouci Colloquium was great because it was a special opportunity to build a network with high-ranking media- and opinion makers, politicians and science representatives from Europe and the USA. The conference was divided into three sessions, each of which highlighted different aspects of the main topic. Session 1, entitled “The Remains of The West – The New Relationship”, discussed to what extent the Donald Trump presidency could be seen as a turning point and an end to the “Pax Americana” and debated the growing pressure on the EU to resolve its internal contradictions and become active in foreign policy. Session 2, entitled “A European Agenda for the Post-American Age”, asked whether the global political upheavals are awakening Europe. The states agree that the EU must be reformed, but the views on further development differ enormously. “European Media Challenge: How to cope with Politics, Technology and the Fight for Trust” was the topic of Session 3, which dealt with the fact that on the one hand there is more transparency than ever before. On the other hand, an excess of information leads to a “system error” in public communication in which facts and opinions can no longer be distinguished. Some of the YEJ participants also contributed to the debate showing the perspective of the younger generation. “I was very passionate and excited while I learned I would be part of the M100YEJ workshop. It was a great opportunity for me to build a stronger network with other participants of the workshop who share the similar purposes and targets. I am very happy that now I am part of this amazing network. This workshop has given me a positive impact and useful knowledge which will be helpful in my future career. I want to thank M100 that gave me this opportunity to be part of this workshop which is very useful for my professional development”.